What is the advantage of using a hybrid system? While using a renewable energy system, using only one type of energy source may not provide sufficient energy throughout the year. In this case, using a combination of two or more renewable energy systems might be more effective in providing for a building's energy needs. Choosing the right hybrid system for a home will depend on the energy requirements, possible system combinations, and budget constraints. What are hybrid wind systems? Hybrid wind systems are systems that use wind energy and another energy source to provide for a building's energy requirements. Most hybrid wind systems will use a secondary renewable source of energy such as hydropower or solar energy. In terms of popularity, a hybrid system combining wind and solar energy is at the top. Solar energy is produced using a photovoltaic (PV) system. What are the basic requirements for a successful hybrid wind system? A hybrid system must satisfy a few basic requirements for it to be an effective energy source. Wind energy requires you to reside in an area where the annual wind speed is at least 9 miles per hour (mph). The site also needs to be largely free from large buildings, as they will obstruct the wind from blowing at its full speed. For a PV system, long periods of intense sunlight is a must. If PV panels are being installed at ground level, it is preferable to install them in a grassy or flat terrain rather than a hilly one. In the case of roof mounting, the panels should be placed at a 15-degree solar south angle, to maximize southern exposure. PV modules should be bathed in sunlight, especially during the peak sunlight hours from 10 AM to 3 PM. Solar trackers that orient PV panels towards the position of the sun in the sky increase the effectiveness of these panels. What are the benefits of using a hybrid wind system? 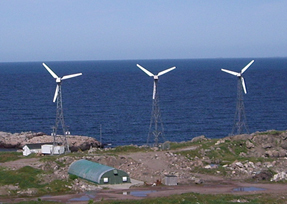 Hybrid systems are remarkably cost-effective for homes in remote locations. This is because the cost of extending the existing power line to a home one mile away is more than the costs associated with setting up a hybrid system. Hybrid systems are also very reliable. PV systems have no moving parts hence do not require any maintenance. Similarly, wind systems only need routine turbine checks. It is easy to increase power requirements in a hybrid system, simply by adding an additional turbine or PV modules to the existing set-up. Both sources are also extremely clean running. Production of energy using a hybrid wind system produces no carbon dioxide and sulfur emissions.